Our daytime dog nursery is an ideal place where your dog can feel a difference during ordinary weekdays. Here your dog will spend a wonderful day being accompanied by the team of dog friends enjoying luxury premises of our dog hotel. Several fenced paddocks and an outdoor playground are available for our pet guests. 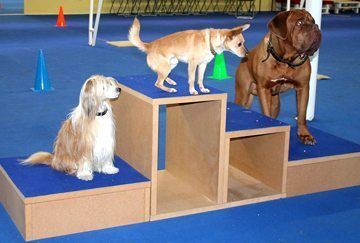 In case of bad weather conditions, dogs can spend their time in the hotel playrooms or in our indoor training hall being under the guidance of professional trainers with years of experience in cynology and dog training. Our dog nursery is located just 20 minutes from Prague. 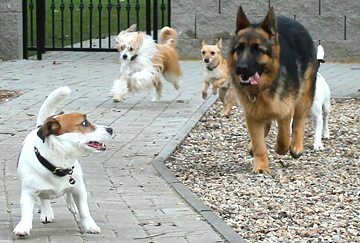 Because of the content of our programmes which are focused on group games, the nursery is primarily suitable for well-socialized dogs. Such a dog will face no problems to cooperate with others and does not express any aggression and fearfulness. Our nursery will also accept shy dogs, we are sure the nursery is an ideal place for them where being under the guidance of experienced instructors they can improve and strengthen their confidence. Currently we neither accept female dogs experiencing mating season nor aggressive dogs being dangerous to humans or other dogs to our nursery. Upon individual agreement we can offer boarding. For the first registration to our dog nursery please contact us directly or by using our contact form. We will be glad to answer any questions regarding the system in our nursery, registration price list, etc. We will contact you shortly to confirm your reservation and offer some further details.